As reported in The Tech on January 18, 2006 and again on April 14, 2006, the former cashier’s office will be renovated to create a new social space for students. Because these plans include the destruction of the popular dollar bill mural, which has been part of student culture since the 1970’s, students have mixed feelings about the renovations. Here is more information on the topic, brought to you by the Undergraduate Association’s Student Committee on Administrative Transparency and Relations. Chancellor Phillip L. Clay commissioned a working group just before the spring term of 2005 with the goal of creating community space in the Infinite. This followed a recommendation from the Committee for the Review of Space Planning (CRSP) to use the cashiers office as a space for student social interaction. The original working group included Phillip J. Walsh, Director of Campus Activities Complex; Deborah Poodry, Director of Campus Planning & Design; Tracy F. Purinton, Assistant Dean for Student Activities, and two undergraduate students, Ali S. Wyne ’08 and Sharlina Hussain ’07. Hussain was later replaced by Andrew T. Lukmann ’07. The framework for the new space included the removal of the dollar bill mural, replaced by large glass walls. This allowed students passing by in the Infinite to see friends as well as Killian Court, and let sunlight into the Infinite from Killian. The dollar bill could not be moved intact because the plaster it was painted on was too brittle. Lukmann said he voiced concern over the removal of the dollar bill. The working group decided, however, that leaving the mural in would block sunlight and reduce the effectiveness of the space as a social area, since passersby could not as easily see friends inside. At the time, there were no plans to preserve the dollar bill beyond high-resolution digital images. The working group presented its framework to students in Spring 2005. Drawings from the architect were put on display in the Bush room near Lobby 10, and students were randomly pulled from the Infinite mid-day and asked for feedback. Walsh said the reactions were generally positive, though no plans were presented that included the preservation of the dollar bill. Shortly after, the working group met with the Class of 2005 Senior Gift Committee and decided that the class gift would be used to make contributions to the new lounge. Because money had already been allocated for construction, the gift would instead be used for the maintenance of the space after construction was completed. A representative of the Class of 2005, John Velasco, was added to the working group. 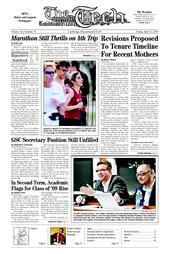 The working group now consisted of three undergraduates: Wyne, Lukmann, and Velasco, and three administrators. Planning for renovations continued throughout Fall 2005, and Facilities began taking high quality digital photographs of the dollar bill in late December. This sparked alarm from many students who, up until then, did not know that the renovations would include the removal of the mural. Estevan Martinez ’08, Dormitory Council liaison to the UA, conducted an informal poll to gather student opinion about the destruction of the dollar bill. The Undergraduate Association also passed a bill during the last session of the term asking for a hiatus in construction until more information could be gathered. The reprieve was granted, and Martinez was appointed as a special member of the working group. Two meetings were conducted after the winter break. The issue of transparency was brought to the attention of the working group for the first time. The results from Martinez’ poll, though admittedly biased, nonetheless emphasized a strong aversion to “another fishbowl” and “being put on display for tourists.” Concern about the fate of the dollar bill was also brought to the attention of the working group, which previously had not received significant opposition to the mural’s removal. According to Walsh, the poll results gathered by Martinez were strongly considered, but were not sufficient to keep the dollar bill mural from destruction. Many students, it is important to note, either approved of the plans of the working group or did not care about its removal. Results can be found at web.mit.edu/tevin/Public/Survey%20Results.pdf. To respond to the poll, the working group included memorialization of the mural in its revised plans. The mural came out of a time of protest and was painted in 1971, one of two murals from this movement to survive (the other is the multicultural mural between Lobby 10 and Lobby 7). Chancellor Clay tracked down the original artist, who expressed surprise that the mural was still there and indicated he was fine with “letting go of the piece as it has served it’s purpose at MIT.” Gathering of history and information about the mural is ongoing, and talks with the MIT Museum about the possibility of recreating the mural using the high quality photographs have begun. To address the issue of transparency, the working group asked the architect to include etchings in the glass wall at about eye level. The etchings would include the history of the dollar bill, a small etched recreation, and information about the 2005 Class Gift. By the Undergraduate Association’s Committee on Administrative Transparency and Relations.